Posted on December 13, 2017 by dressings. The Tubifast Bandage is light in weight and tubular in construction. The bandage is quite high-tech and does not fray on use. The dressings stay in place with the help of this bandage that holds and secures the dressings without constriction or compression. With an elasticated rayon fabric construction, the Tubifast bandages are ideal for skin covering and dressing retention. Wound-Care brings to you an array of Tubifast Bandages in different shapes and sizes. 1) Tubifast Bandage Red 3.5cm x 1m Pack Size 1-This Tubifast Bandage is red in colour and is available in Red 3.5cm x 1m Pack Size 1. 2) Tubifast Bandage Green 5cm x 1m Pack Size 1-This is green in colour with dimension 5cm x 1m. 3) Tubifast Bandage Green 5cm x 3m Pack Size 1-A green colour 5cm x 3m bandage, this is helpful in reducing pain and swelling. 4) Tubifast Bandage Green 5cm x 5m Pack Size 1-5cm x 5m in dimension, this green tubifast bandage holds the dressings without any constriction. 5) Tubifast Bandage Blue 7.5cm x 1m Pack Size 1-This blue bandage provides relief from minor soft tissue injuries and is 7.5cm x 1m. 6) Tubifast Bandage Blue 7.5cm x 3m Pack Size 1-The Tubifast Bandage Blue 7.5cm x 3m provide constant support to the area it is applied. 7) Tubifast Bandage Blue 7.5cm x 5m Pack Size 1-This blue bandage is quite breathable and is 7.5cm x 5m in dimension. 8) Tubifast Bandage Yellow 10.75 x 1m Pack Size 1-This 10.75 x 1m can provide relief from joint instability. 9) Tubifast Bandage Yellow 10.75 x 3m Pack Size 1-This yellow tubifast bandage is 10.75 x 3m in dimension. 10) Tubifast Bandage Yellow 10.75 x 5m Pack Size 1-Yellow in colour this 10.75 x 5m bandage provides exceptional coverage to the dressing on your wound. 11) Tubifast Bandage Purple 20cm x 1m Pack Size 1-The Tubifast Bandage Purple is 20cm x 1m in dimension and offers great benefits. 12) Tubifast Bandage Purple 20cm x 5m Pack Size 1-Available in purple colour, this 20cm x 5m bandage is made of elasticated viscose. 13) Tubifast Bandages-This is elasticated with radial and longitudinal stretch. The bandage is available in various widths and sizes. Where not to use Tubifast Bandage? Check out Wound-care.co.uk and get an opportunity to heal all wounds and abrasions in no time. A renowned name in health care management, Wound-Care is sure to deliver you with the best. With an extensive range of Tubifast Bandages available, we strive to provide you with the best facilities. Posted on November 23, 2017 by dressings. Being a well-known name in the healthcare management world, we at Wound-care strive to provide you with a service level that is second to none. A leading online retailer for an array of medical dressings, bandages, surgical tapes, compression hosiery, etc. we stock the most comprehensive range of wound-care products. Browse our official website and check out the medical care products for your requirement. At wound-care you can select from an extensive range of dressings. Right from hydrocolloid dressings to honey dressings, charcoal dressings, polyurethane foam, dressings and many more, we have all available at one place. Dressings are essential in healing various kinds of wounds. Be it infected wounds, non-infected wounds, highly exuding wounds, burns, abrasions, cuts, etc., we at wound-care ensure speedy recovery of all your major and minor wounds. It is crucial to look for a suitable dressing as the comprehensive range of dressings we stock, performs different functions depending on the type of wound it is applied to. The Mepitel Dressings are ideal for diabetic, arterial ulcers, etc. Similarly, Kaltostat Dressings are apt for both acute and chronic wounds. Check out an eclectic range of bandages at wound-care. When it comes to providing pressure-sensitive adhesive tapes, surgical tapes come to the fore. Offering a comfortable grip to your wounds covered with bandages, these tapes make sure your skin does not suffer any maceration. You can use them to fix swabs, dressings, catheters, tube etc. 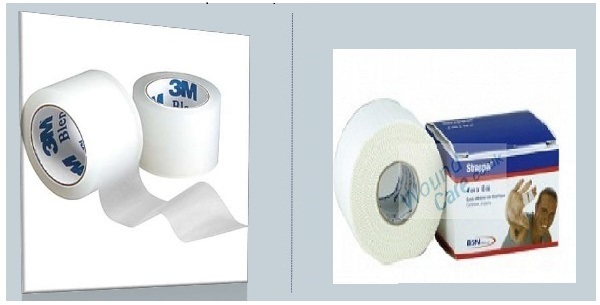 Wound-care introduces a wide range of skin friendly surgical tapes. We have Mepitac, Mefix, Micropore, Omnifix, Scanpore to name a few. Most of them are easy to remove and provide utmost support to your dressings etc. We need hosiery to reduce risks of ulcers, prevent the recurrence of thrombosis, and mostly to regularize the circulation of blood in the legs. These can come in a range of 10mmHg to 35mmHg. At wound-care we have compression hosiery in various sizes and colors as per your comfort. If Activa Class 1 Below Knee Stockings provide treatment of superficial and earlier varicose veins and varicosis during pregnancy, then Activa Class 2 Thigh Length Open Toe Stockings prevents you from leg ulcers, mild oedema and varicosis during pregnancy. We have for you the best-selling products at wound-care. Check our site for more details. When you have the best around why look for alternatives? With best reviews from our regular clients, we are here to guide you on every step. Connect with us at wound-care.co.uk and procure all your wound-care requirements at one stop. Delivering globally, with the majority of order being dispatched within 1-2 working days , we accept Pounds, Euros, and Dollars too.We supply clinics and hospitals Worldwide - contact us for wholesale and export pricing. Choose Wound-care for choice and service ! Posted on January 9, 2016 by admin. Healing is a holistic process that requires caring, precautions and perhaps, a few blessings too, but the first, most critical step is to manage the wound and this is why you need relevant wound-care products. One must always be equipped with high quality wound care essentials to combat any injury. Immediate medical attention is essential, but what’s more vital is right medical attention! Scroll down to know what all things you need to keep in mind before you head on to make the purchase! Most crucial thing that needs to be taken care of during the purchase of medical equipments, especially wound care essentials is that the products should be of superior quality, sterilized and certified. The products should meet the hygiene and manufacturing standards set forth by the concerned authorities. Whether you are shopping online or offline for wound care essentials, make sure that you only associate with highly trusted and acknowledged dealers. The markets are flooded with cheap and low quality products, which is why it is important that one must rely upon a trustworthy dealer for wound care requirements. 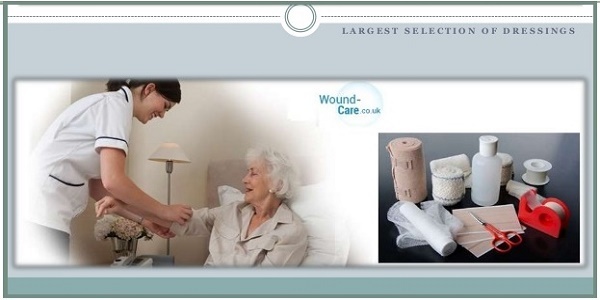 Wound care essentials comprises of a wide range of products. In your quest for essential wound care supplies you will come across various types of bandages, dressings, compression hosiery and surgical tapes, so before you make the purchase take a look at the material used and make sure that the products are of premium quality. Explore the online world and you will come across various reliable online portals that will offer certified and optimum quality wound care products. Woundcare.co.uk is one such name that has an extensive range of products to offer that too at competitive prices and quality assurance. If you still have not added these essential wound care supplies to your first aid box then hurry, order for them now!